This Little Beaver with a 13:1 medium speed gear ratio is ideal for medium to very rocky or hard ground drilling. It revolves at 270 RPM and is also very efficient for drilling in clay. Auger sold separately. This with a 13:1 medium speed gear ratio is ideal for medium to very rocky or hard ground drilling. It revolves at 270 RPM and is also very efficient for drilling in clay. Not only does this increase your drilling productivity, but it also results in cleaner holes. The mechanical earth drill gets into areas inaccessible to skid-steer loaders. When traveling over manicured turf areas, the easy rolling wheeled carriage leaves no marks, eliminating costly turf restoration. This is a great one man hole digger for so many different uses. If you are installing fence or using the horizontal boring option to dig under a driveway, the possibilities are endless. 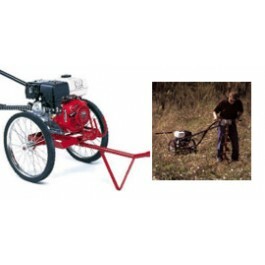 This auger is a one of a kind mechanical hole digger that will last you a lifetime. 1 (ONE) year limited warranty to replace for the original purchaser, free of charge, any part or parts, found upon examination by any factory authorized service center, or by the factory at Livingston, Texas, to be defective in material or workmanship or both. If your equipment cannot be repaired, it will be replaced. All transportation charges on parts submitted for replacement under this warranty must be done by the purchaser. Engineered To Work... And To Last! builds their own heavy-duty transmissions that feature cooling fins for quick heat dissipation, o-ring seals, and heat treated shafts and bearings mounted in an oil bath. The engine throttle control and the on/off switch are conveniently located on the left handle. Padded handles are ergonomically designed for less fatiguing operation. A reliable, centrifugal clutch slips when a buried object is encountered or the auger is overloaded. This protects the flexible drive cable and the transmission gears and shafts from damage. A convenient snap button holds the auger securely to the transmission adapter and lets you easily connect or remove augers and extensions without pins or tools. offers a complete line of snap-on augers in both 36" and 42" lengths. Diameters range from 1.5" to 16". We also offer snap-on extensions, in both full flighted and tube configurations. Auger sold separately.